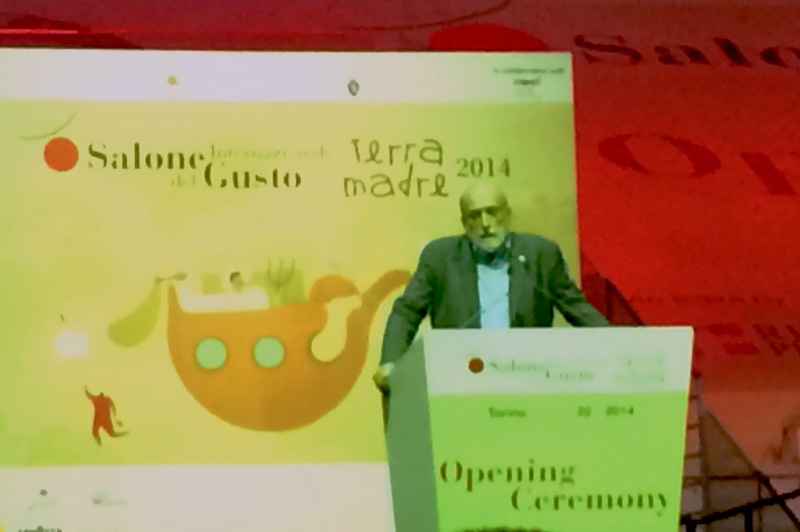 The Slow Food movement got its start in the late 1980’s when Carlo Petrini rallied friends and supporters to protest a McDonalds restaurant slated to come to Rome. Their argument was that fast food would be damaging to the local food culture; instead, people needed slow food. 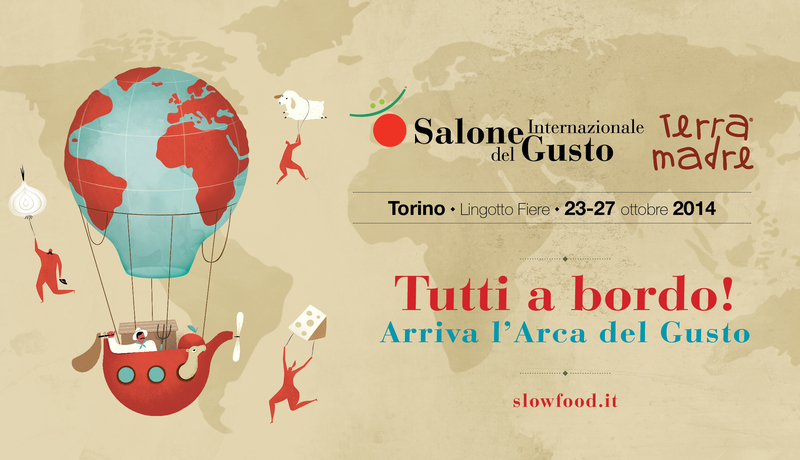 The Slow Food Manifesto was drafted in 1989, with support from 15 international delegates. 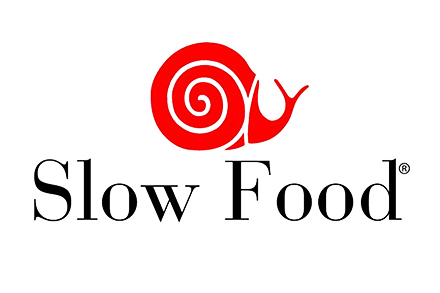 Today, Slow Food has over 150,000 members and is active in more than 150 countries, including national associations in Italy, the U.S., Germany and Japan. There are more than 170 chapters and 2,000 food communities in the United States alone. 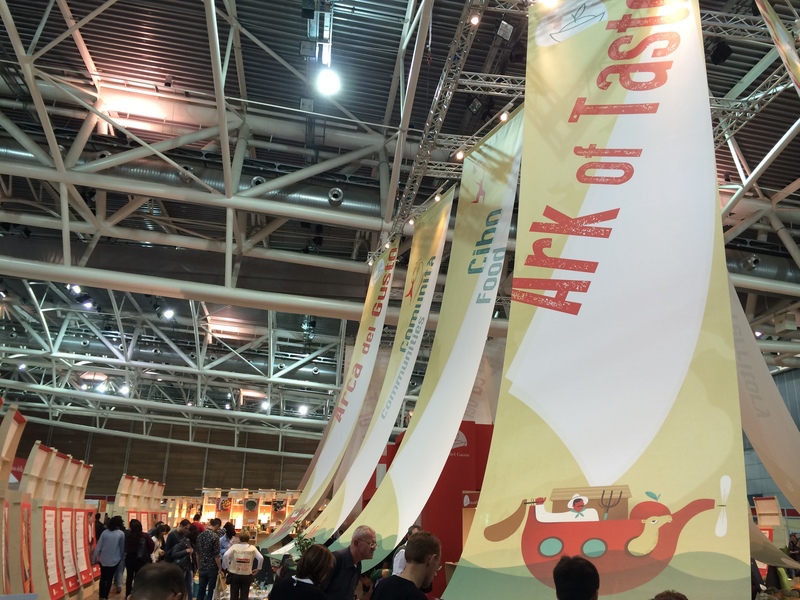 Every two years, Slow Food hosts the world’s largest food and wine fair, Salone del Gusto, in conjunction with the Terra Madre world meeting of food communities, drawing over 250,000 visitors combined. I had the opportunity to attend this event, currently in its 10th year, on October 23-27. 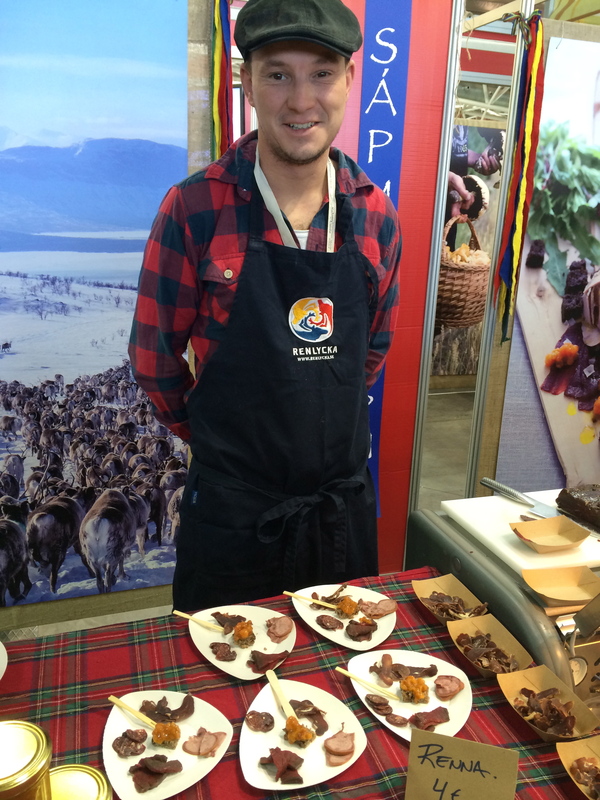 The event brought delegates from over 100 countries to exhibit and share their food cultures. 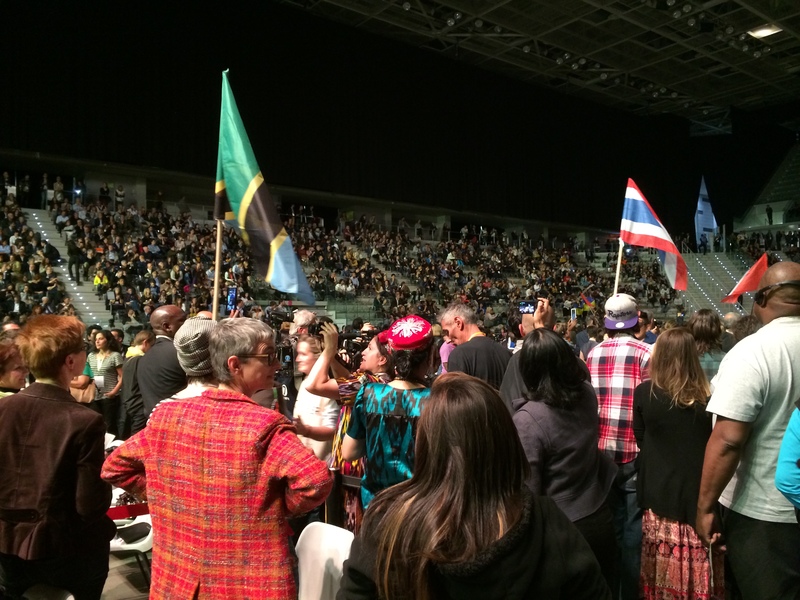 The event kicked off with an opening ceremony that included a procession of flags from around the world (including Aretta Begay carrying the Navajo Nation flag). In what truly felt like the Olympics of food, it was amazing to see representatives from around the globe, many of whom are currently actively engaged in hostilities against one another (for example, Russia, Ukraine, Palestine, Israel, United States, Iran, etc) march in together, set up table representing their food culture. The opening ceremony also featured a representative from South Africa speaking about how laws to protect marine species have criminalized small fisher operations; Anna Grossmanova from the Czech Republic describing a youth focused community based kitchen and sensory lab; Roba from the Karrayu Tribe in Ethiopia who described the difficulties of herding when multinationals take the land for sugar cane production; Ivo Kara from Pesic Croatia who described focusing the local economy on Ark of Taste varieties to avoid having food culture become homogenized since joining the EU; Alice Waters from the US who described the importance of “edible education”; Joei Asari from Oita Japan whose family produces Koji (starter foods for miso paste, saki, soysauce), a food he claims strengthens the immune system and detoxifies the body. 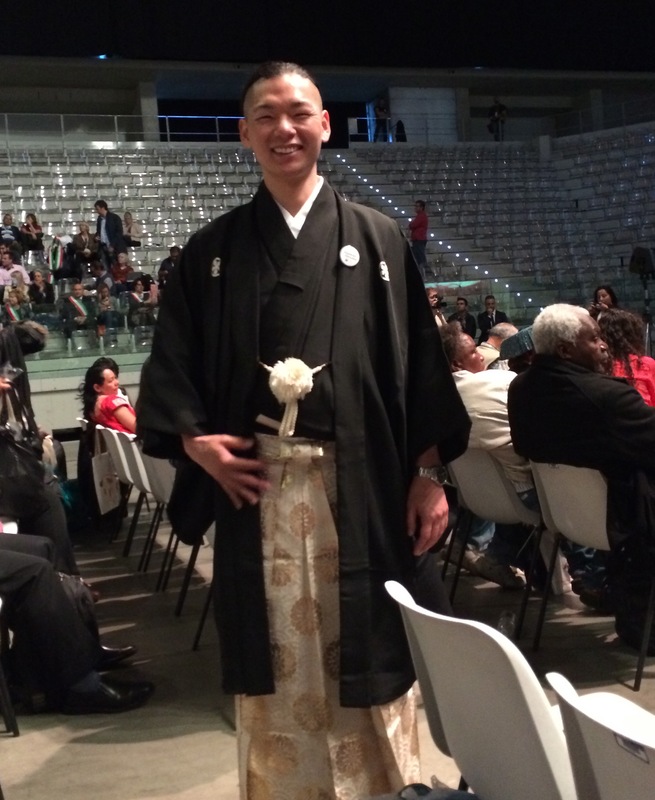 He hopes it will help residents of Fukishima in recovering from the nuclear exposure. Selvi Naji from India spoke about the indigenous terra madre network and the Alu Karumba del Tamili Nadu people in India who are working on a survey of their traditional and sacred foods, and Edward Mukiibi from Uganda described the Slow Food Project which aims to help install 10,000 gardens in Africa. 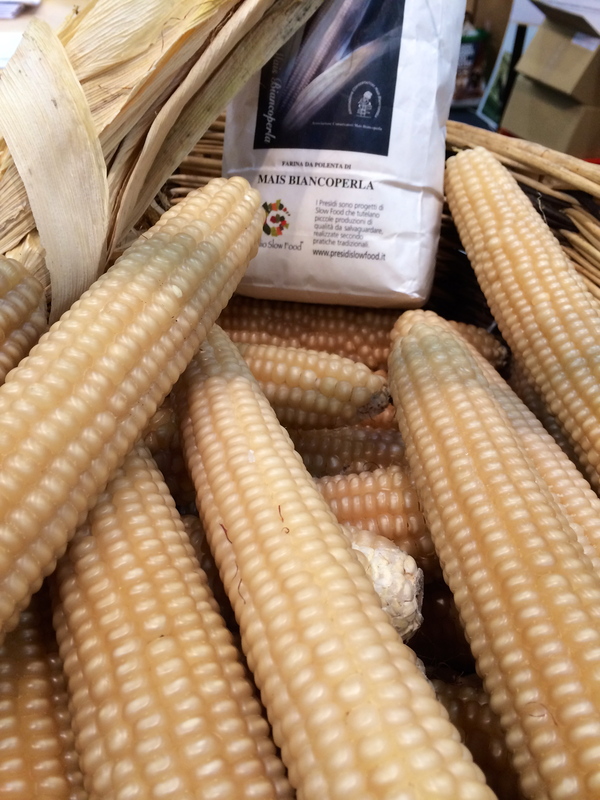 The focus of my trip to Terra Madre was to learn more about the issues impacting the food systems of indigenous people, especially relating to seeds and farming. 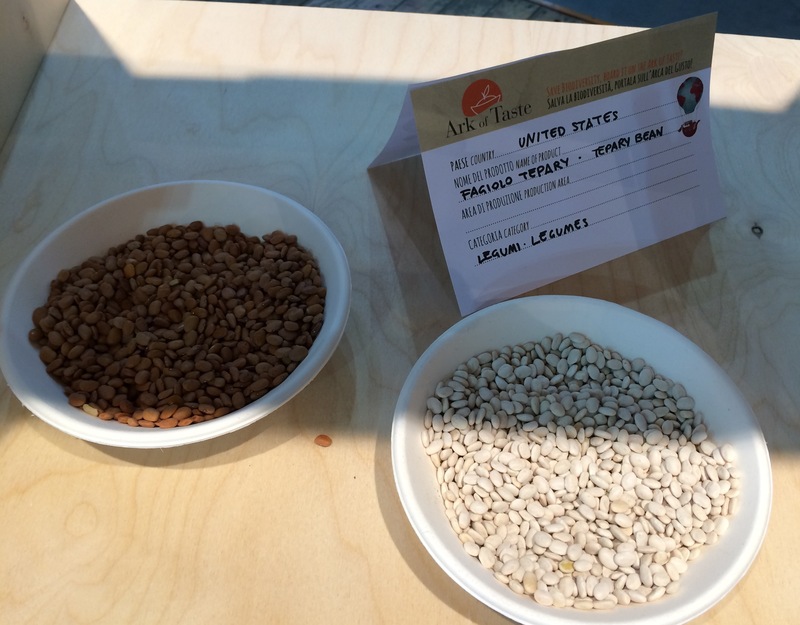 Seeds were an often mentioned topic in the Indigenous Network room, as well as among European farmers. 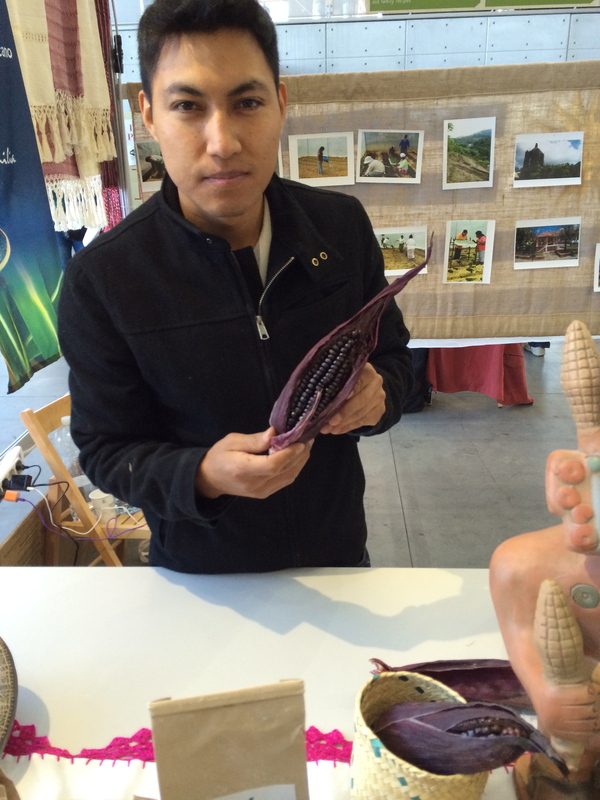 Jamie Holding Eagle, whose work I will describe below, made a point of describing seed keepers—not savers, to emphasize the familial relationship that many communities feel they have with seeds. Seed keepers don’t “own” seeds per-se, but rather are protecting them, ensuring their survival and propagation. The summary of issues below is taken from several panels and session that I attended over the course of the conference. One of the main threats that people felt they needed to protect their indigenous seed varieties from was the encroachment of GMO’s. During opening ceremony, Adelita San Vicente from Tello Mexico spoke the struggle of farmers in her country to preserve their corn. 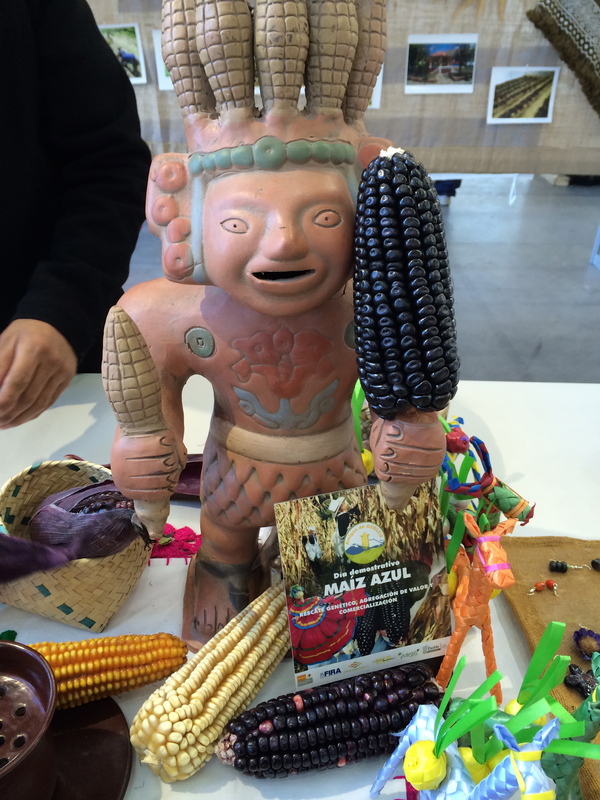 Adelita is the director of Seeds of Life (Semillas de Vida), a group promoting agro-biodiversity and protecting native corn, and is also a convener of the Mexico-wide food sovereignty coalition Without Corn, There Is No Country (Sin Maiz, No Hay Pais). She spoke about how her organizations, among others filed a class action lawsuit against the ministry of environment, Monsanto, Dow, Syngenta and Pioneer to prevent the continued planting of GMO corn in Mexico. This led a judge to ban GMO corn in October 2013 until the suit is settled. There have been 73 appeals against the decision but the real trial hasn’t begun yet. In addition to concern about contamination of native varieties, representatives were concerned about these same companies patenting indigenous varieties, making it impossible for the communities who developed them to benefit financially. In a panel about indigenous seed issues, James, a representative from Kenya described how Native grasses in Kenya have been patented by US and Australia. Now farmers who have been conserving those seeds are not able to benefit economically from their conserving, but rather have to get the rights from someone else. To help remedy the situation, he pointed to the International Treaty on Plant Genetic Resources for Food and Agriculture, which stipulates the rights that farmers have to save, use, exchange, and sell farm-saved seed and propagating material. 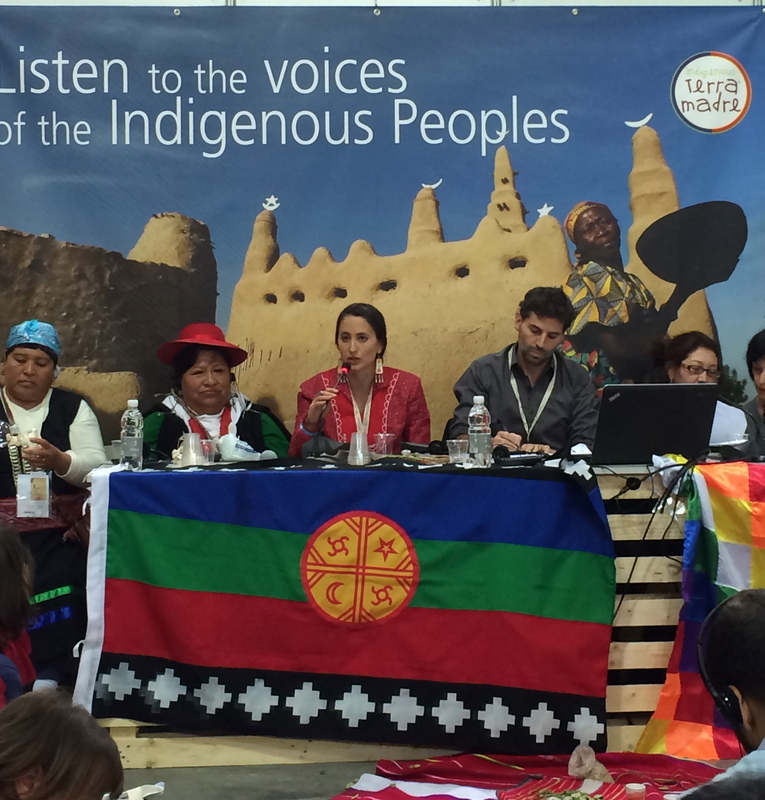 While slightly different than the situation facing most indigenous farmers in the world, European farmers were present at Terra Madre describing similar struggles against the multinational chemical companies that control the seed industry and have also helped to shape agricultural policy in Europe. Klaus Rapf from ARCHE NOAH, an non-profit organization in Austria dedicated to preserving the diversity of culturally important seed varieties, described how EU policies around seeds have two competing narratives; 1) Plant genetic resources belong to the past. They’re a museum attraction, should be collected in gene banks and kept alive in niche,s and 2) Plant genetic resources provide for the future of food security for mankind. Klaus feels that we need to move from conservation to sustainable use. The problem with EU seed marketing laws in his opinion is that only an industrial standard is allowed. He described how a plant variety must fulfill 3 qualifications in order to be marketed: 1) distinctness—it has to be clearly distinguishable from any other variety 2) uniformity—it has to be highly uniform in its characteristics 3) stability- the variety has to remain unchanged after repeated propagation. 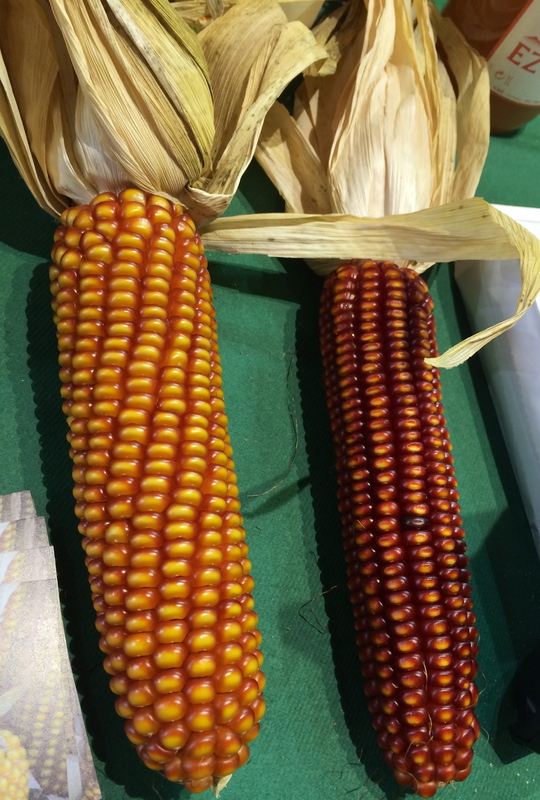 Many traditional and heirloom seed varieties do not fulfill these qualifications because they have genetic richness built in, which has allowed them adapt to local conditions. According to Klauss, because these seeds with more variation than industrial seeds can’t be marketed by farmers, the EU laws stymie biodiversity and are gradually leading to the loss of traditional and local food. Similarly Andrea Ferrante, the European coordinator of Via Campesina described through a translator how Europe spends a great deal of money on agricultural policy, but similar to the US, that money goes to a very small number of farmers, with large farms. The average farm in Europe is 12 hectares, not the industrial farms benefitting from these policies. Andrea emphasized the importance of recognizing small farmers for their contributions to agriculture. “The farmer for the last 10,000 years has built up a vegetal biodiversity…the biodiversity of all we eat has been produced by billions of farmers who tilled the land in the last 10,000 years. In the past few years agricultural policies made it difficult to do their job and increasing the whole farming model depends on the external world.” The representatives on this panel demanded the abandonment of this legislation, as it serves only large corporations, and the liberalization of the EU seed market. It was these concerns about loss of biodiversity that motivated many of the speakers to push for better support of small farmers and less support of industrial seed companies. James from Kenya described how before the introduction of commercial seeds in Kenya, people relied on agrobiodiversity, which insured resilience in times of drought. He pointed out that 80% of seeds being sold now are controlled by 6 chemical companies (30% by Monsanto), and that these companies have transformed the diets of people in is country. Where as farmers once grew crops that were adapted to their specific region, now maize is considered the staple food to grow, even in areas it is not well adapted to. Now there is a disease affecting the maize, lethal necrosis disease, with some people losing all of their crops. He argued this wouldn’t have happened in a time when farmers planted greater variety. Klaus from Austria wants to fight against this homogenization of crops in his own country by promoting biodiversity with a label, and engaging in a participatory breeding network. He doesn’t see old and heritage varieties as something fixed in history, but as opportunity for development. 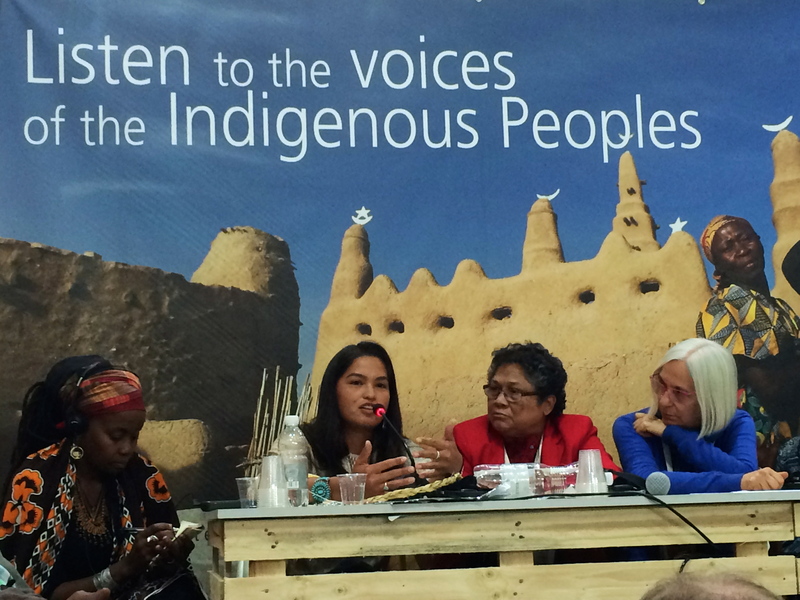 A number of indigenous women present were involved in organizing to preserve biodiversity. Sunita Rao works with women’s seed collective called Vanastree in Southern India—one of biodiversity hotspots of the world. She’s interested in small scale integrated forest gardens and kitchen gardens, domesticated as well as wild food.She pointed out that women are important custodians of seeds, lands, earth, and ethnoculinary traditions, but are nearly invisible in the agricultural sector.“In our region the entire landscape can be called a seed bank important to recognize the land as a seed bank.” When asked to elaborate on this concept, she described that in the home gardens where she works they found between 65-319 different species of food plants. Similar to Klaus’ feeling that the best way to protect biodiversity is through the sustainable use of seeds, Sunita is working to make this a possibility for Indian women. Nicole Yanes from the Opata tribe in the Sonoran desert in Northern Mexico (and founder of the ASU student organization Light is Life Food Sovereignty Project) brought with her chiltepin peppers, the undomesticated mother of all chilies that are facing extinction because of land and water exploitation, and because people are no longer saving the seeds. She is on a quest to make sure that this ancient variety doesn’t disappear. 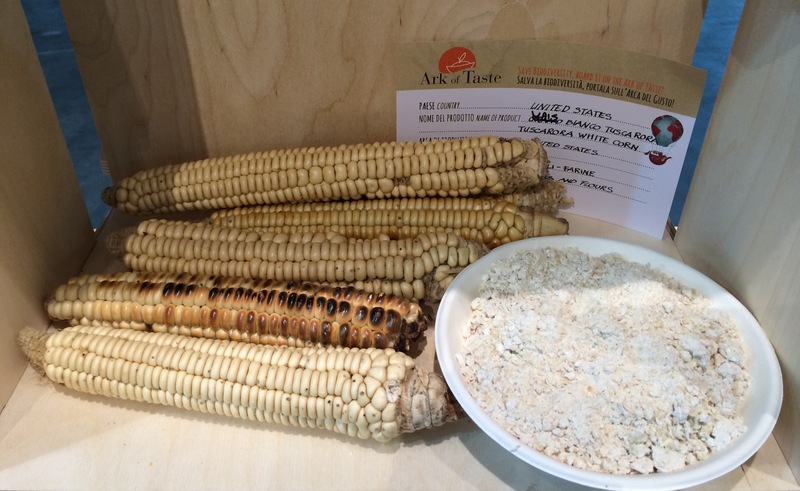 The purpose of the Slow Foods “Ark of Taste” is to try to encourage the consumption and preservation of some of this biodiversity. The Ark has gathered a list of 2,015 plants, animals, and food product that are endangered, and encourages people to grow them. 183 of the products on this list are from the United States. 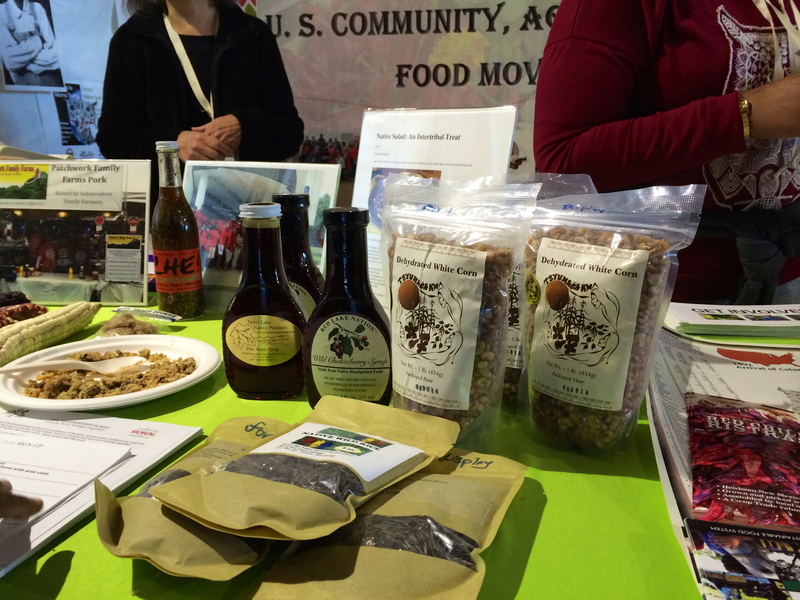 At this year’s Terra Madre, over 1000 products were on display from 108 countries. The purpose of the Ark is to point out the existence of these products, draw attention to the risk of their extinction within a few generations, and to invite everyone to take action to help protect them. This might mean purposely buying and consuming them, telling their story and supporting producers, or in the case of endangered wild species eating less or none of them. Products nominated are foods that have distinctive qualities in terms of taste, must be linked to a specific area, to the memory and identity of a group and to local tradition, products must be produced in limited quantities, and be at the risk of extinction. The chiltepin pepper mentioned above, is one of the plants on the Ark of Taste. While the focus of most of the panels I attended was seed crops, there were also indigenous people speaking about the importance of maintaining herding cultures. Aretta Begal works with the Navajo Churro land presidium as well as Dine’ Be’ Iina’ Navajo Lifeway, which works to connect sheep producers with chefs. (Read more about the Navajo churro in our post about Black Mesa Water Coalition). Churro sheep have been bred by Navajo people for generations to be adapted to the arid southwest where they live off of desert shrubs like sage that impart their medicinal qualities into the meat. In an effort to ensure that these sheep are maintained, Aretta helps to host workshops and tasting events, demonstrating how you can prepare the meat and how to properly maintain range and flock health (including ram exchanges across different communities to keep flocks genetically healthy.) Aretta is currently working on a small recipe book using all local ingredients, as another way of encouraging people to cook and consume traditional sheep dishes. Far to the north and east of Navajo, Ol-Johan Sikku described the 25 different reindeer herding peoples in the Arctic. Land grabbing has affected indigenous people in Nordic countries, where he described “land is taken by law and decisions and not by force anymore.” He cited the importance of adhering to the pre, prior and informed consent clause in the UNDRIP, regarding the utilization of indigenous land and resources, in order to ensure that Sami reindeer herders like his family can maintain their way of life and foodways. The notion of food as medicine was also a popular theme along this vein. 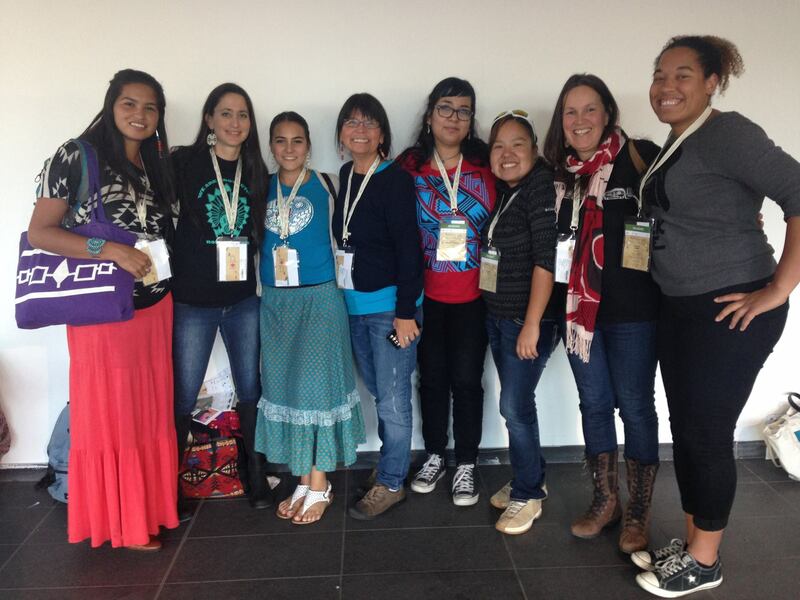 Aurora (Aymara) and Raquel (Mapuche) described how their people in Chile were suffering new diseases because traditional food is medicine, and their bodies need it. Because of land dispossession due to forestry operations and hydroelectric projects, as well as agricultural programs, they are decreasingly able to plant their indigenous seeds. One of the challenges of promoting traditional medicines and foods is the risk that they will become popular with others. Prairie Rose described how most of the Echnacea in her region has become uprooted since being proven to have immune boosting properties. Similarly, Train Chuladecha, a traditional medicine practitioner from Thailand, described how once plants are determined to have medicinal properties, they are patented, packaged for the world market, and then harvested to near extinction. She described a plant called Eurycoma longifolio jack, which used to be used to heal fevers, but then everybody picked it all to sell and now there is none for the indigenous people who developed the original healing recipes. She is working with villagers to try to produce sustainable forest gardens to ensure the maintenance of their medicines. 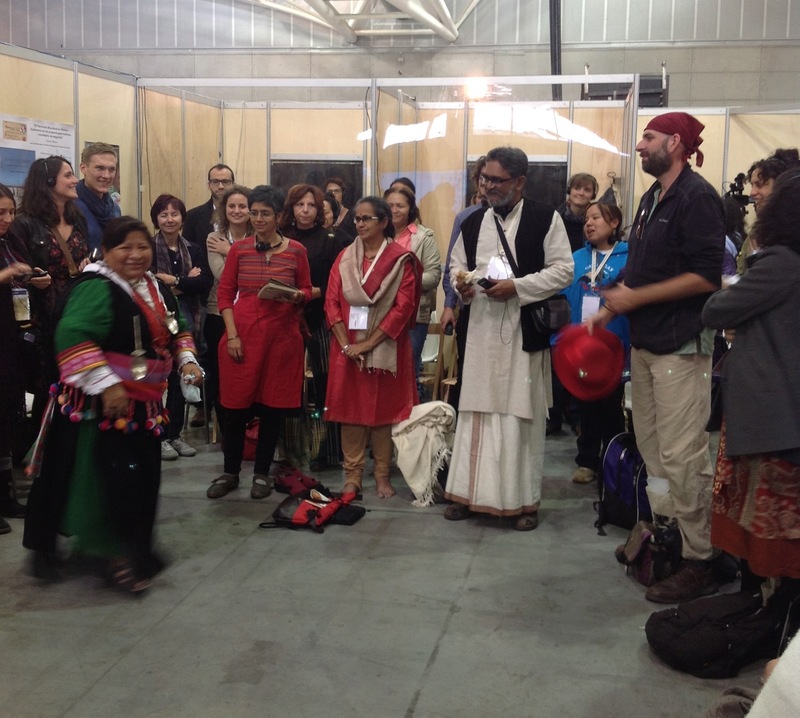 In closing, it was amazing to meet representatives from around the world who despite the vast differences in their home nations, languages and cultures are all facing such similar challenges in preserving their indigenous foods. Some like Sunita Rao from India recommended community level action in preserving seeds, others like Adelita San Vicente from Mexico have been fighting for national legislation, and still others like James from Kenya recommended international protection like the International Treaty on Plant Genetic Resources for Food and Agriculture. 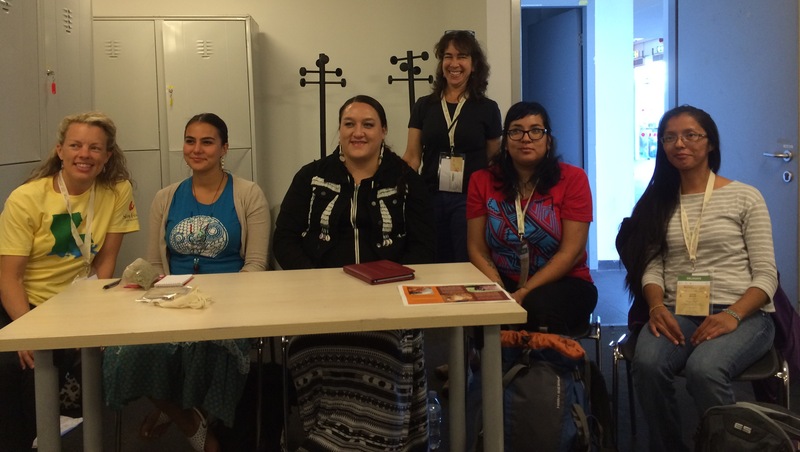 People gathered after sessions to work across language barriers to continue to share stories and offer support and encouragement. 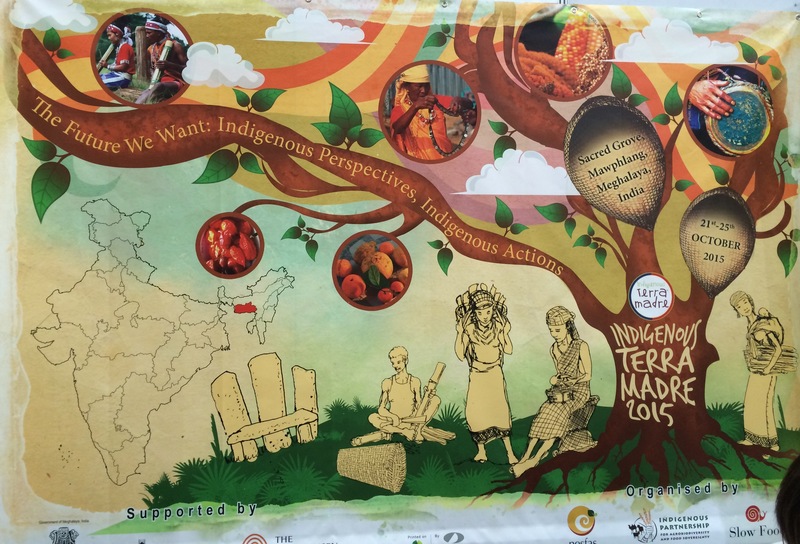 It is my hope to attend Indigenous Terra Madre in 2015 to learn more about the world-wide struggle of Indigenous people to protect their food resources.